You can see your machine manufacture something in real time. What about monitoring the data of what your machines are doing in real time? It’s possible! Software can be utilized to collect and analyze machine activity data such as MTConnect, Fanuc FOCAS, plus custom macros, and the aid of certain hardware devices. 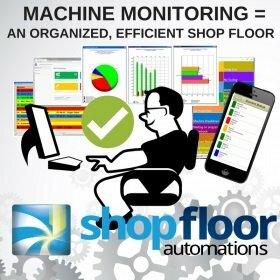 An easy-to-view dashboard, as well as charts and historical reports, can help your shop floor monitor downtime, runtime, and OEE data. As discussed in a previous blog, you can get email notifications when there are any production delays due to your machines. You can also get text messages. These different messages can also be targeted to specific operators who work different shifts, which means one employee who is off for certain shift doesn’t have to hear about a machine that is down when employee two can handle it. Options for machine monitoring you can take advantage of range from a convenient application, a permanent license you own, or a month-to-month license that does not require on-site servers. Be sure to call us if you want more information at (877) 611-5825, or ask us questions on social media!